IWW Couriers Network launches first national campaign! 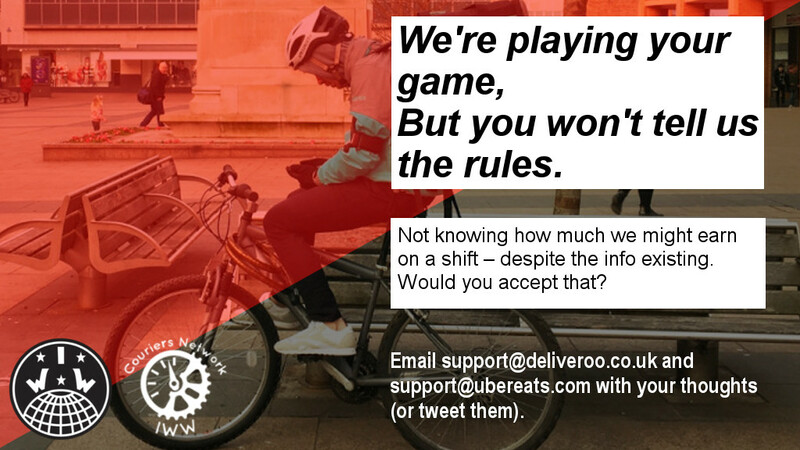 28/08/2018: A grassroots trade union focused on organising couriers in the gig economy has launched its first national campaign for better transparency from Deliveroo and UberEats. The IWW Couriers Network, part of the international trade union, the Industrial Workers of the World, has launched the “We’re playing your game but you won’t tell us the rules!” campaign to force gig economy food companies to radically improve their approach to transparency and the information that they share with their couriers. It comes after Deliveroo has attracted criticism from couriers for forcibly switching – or sacking – couriers employed on an older Pay Per Hour contract, as opposed to the new, piecemeal, Pay Per Drop contract, without telling couriers why. UberEats has also provoked anger from its couriers in recent months for deliberate pushing down bonus payment rates on deliveries– the main way that couriers make money – again, with little communication about why these remain so low. Transparency of termination: Clarity regarding the exact reasons for terminations of our contracts so we can know why we’re out of a job and the right to a fair appeals process. Transparency of orders: A weekly report in the app letting us know the deliveries per couriers per hour in each zone of our respective locations, so we can plan our work week accordingly. Transparency of pay: An easier to understand payslip so we can more easily process our tax returns. Currently organising in cities and towns across the UK and Republic of Ireland, the IWW Couriers Network has grown significantly since starting in January 2018. With hundreds of members across Bristol, Cardiff, Glasgow, Edinburgh, Aberdeen, Dublin, Derry and Cork, the union’s innovative direct-democracy network model for organising workers – where couriers rather than union officials lead the campaign and make key decisions– is introducing a whole new generation to collective action and unions.